There is something inspiringly authentic and honest about unsung creative folk who just quietly get on with their own thing. Often hidden from view, every summer the artists, designers and makers in my local area open their doors to the public for the annual Warwickshire Open Studios event. I've been along to a few events in previous years and so when I heard about a project photographer Fiona Murray has been working on to document the process, practice and creative spaces of some of the people involved I arranged to meet up with her over tea and cake to find out more. Since graduating from Glasgow School of Art Fiona has worked as a professional photographer for numerous editorial and commercial clients including Channel 4 - she documented Kirstie Allsop's crafting journey for them - focusing on authentic and creative images of people, interiors, crafts and products. It was her move to Warwickshire from Scotland that provided the initial impetus for the creative spaces project. Arriving in a new town after working in Glasgow for ten years Fiona was keen to meet like minded people and find new friends amongst the creative community. "When I first moved to Warwickshire I felt the only way I could make that initial contact was by sharing my skills," she said. One of the first people she met was Elisabeth Edwards (whose beautiful ceramic work I've previously featured on Design Hunter) who in turn introduced her to some of the organisers at Warwickshire Open Studios. "It wasn't really a project at first, just a way to meet people. However as Warwickshire Open Studios is primarily a voluntary organisation I thought I might be able to help promote it through images. Many artists forget that the organisers can only do so much to promote the various venues and locations and that the artists taking part have to promote themselves too." Fiona began the project in her down time from her work as a commercial photographer. "I really wanted to refocus the way I see," she said. "It may sound strange, but coming from a fine arts background I just missed making images which made me happy. Often when I talk to artists the process is just as important as the final piece and I wanted to create images which echoed this, documenting the environment artists worked in and how their process informed their practice." Amongst the people Fiona has recently photographed are the potters who work at Ditchford Farm in Shipston on Stour. They include Elisabeth Edwards, Alice Shepherd, Emma Clegg and Binki Edmonds. "I may be biased, as all the potters who work there have become my friends, but I love the place and really recommend visiting during the open studios" she says. "Did I tell you that there is a secret kiln pizza club there too? It may be a little risque of me to suggest that one day there may be a slice of pizza on offer, if not there are always lots of cups of tea and cakes." Through Berylune, a local craft shop, she also met Lara Smith who is exhibiting her quirky screen printed textiles as part of the Open Studios event. Alongside the Open Studios project Fiona is also currently working with lots of online shops, both advising them on how to get the best out of their equipment so they can photograph their products themselves, and creating product images for them. "Images sell" she says. "I've learnt that over the years as a commercial photographer, you only get to make one first impression and so make it a good one." Warwickshire Open Studios runs from 29th June to 14th July 2013. 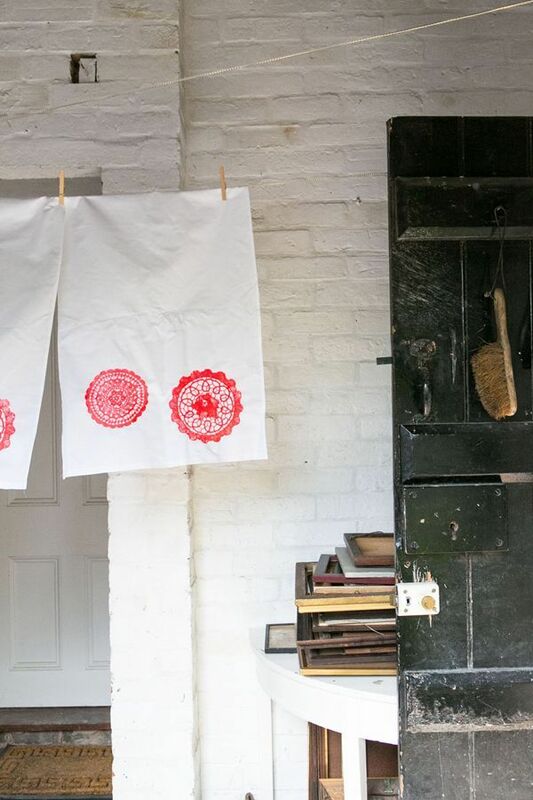 You can view more of Fiona's images documenting the studio spaces and work of designer makers in Warwickshire on her blog. All images courtesy of Fiona Murray.